As someone who draws inspiration and nourishment from both good writing and visual art, I registered for “A Unique Book Club: Words and Images” in the Continuing Studies program at the University of Toronto. This is a six-week course that meets once a week, taught by Tina Urman during March and April. She selected five novels in which visual art plays a central part in the story. Our last meeting next week will be at the Art Gallery of Ontario. There are a number of things in this course/book club that stand out for me. One is the way the instructor placed each book in historical context, which illuminated both the visual art in the book and the writing. Another is that in her lectures she also told us what inspired the authors to develop the stories in their books. For example, Tracy Chevalier, the author of “Girl with the Pearl Earring,” had hanging in one of her rooms a poster of Vermeer’s painting and had looked at this face for years. When she was at a loss for what to write next, as she thought about the painting and wondered who the girl was, she decided to imagine her and tell her story. So it seems Griet, the servant girl was gestating in the author’s imagination for years. During the class focusing on this book, Urman gave a PowerPoint presentation of Vermeer paintings (she projected paintings on screen for all of the books, works of artists that played a part in each of the books we read). 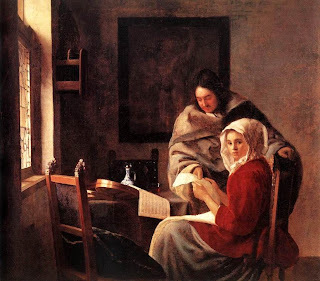 She chose two of the Vermeer paintings, suggested an opening word for a sentence or paragraph, and asked us to write what our imaginations gave us about these paintings. The Vermeer paintings are full of details and “props” that tell us a great deal about global expansion in the seventeenth century. 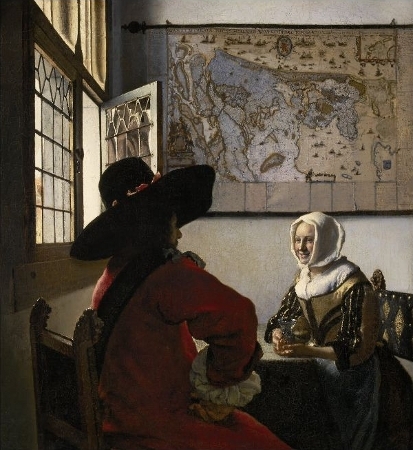 A related book, “Vermeer’s Hat - The Seventeenth Century and the Dawn of the Global World” by historian Timothy Brook of the University of British Columbia, explains that because of European explorers, wealthy Dutch households had access to, and could afford, Persian carpets and porcelain from China and were included in Vermeer’s painting. It’s interesting that many of Vermeer’s paintings include either maps or a globe. My guess is that the title for “Vermeer’s Hat” comes from the painting “Officer and Laughing Girl” used on the book jacket. The officer in the painting is wearing, of all things, a hat made of beaver pelt. We learn from Timothy Brook’s book that European beavers had been overtrapped, and after cleaning them out in Scandinavian countries, Europeans turned to North America and took home Canadian beavers for their hats. As you can see from my ramblings about the course I took, one novel about a servant girl named Griet has taken me for a long fascinating ride far beyond her story.